The production of many aeroallergens in the air, especially pollen, depends on the season of the year. The start of the grass pollen season in the United Kingdom can differ by about 32 days according to the weather in the spring and early summer. However, trends in pollen abundance are more strongly linked to land-use change and farming practices than to climate (85). 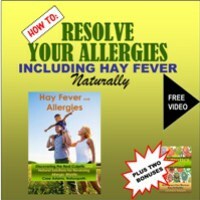 Hay fever consultations have been shown to coincide with the onset and duration of the pollen season. Climate change is likely to change the seasonality of pollen-related disorders such as hay fever. However, it is not yet known whether this would entail a season of longer duration in addition to an earlier onset. There are local differences in sensitivity to different pollens, and this makes forecasting future health effects difficult. As with many atopic diseases, the prevalence of hay fever is rising in Europe; the reasons are not clear but do not include climate change. Small changes in seasonality associated with climate change in the future may affect many people, and the aggregate impact of climate change on health might be significant. The relationship between climate change and respiratory diseases is complex. Beggs & Curson (86) have developed an integrated environmental model of asthma. Climate change is likely to affect (indoor) cockroaches, moulds and fungi, damp in modern building materials, dust mites and (outdoor) pollen and air pollutants. The seasonality of asthma is complex and not well understood. In the United Kingdom, for example, seasonal peaks vary between age groups, suggesting different causative factors. Only about 10% of admissions to hospital due to asthma are estimated to be related to pollen allergens (87). Climate change may therefore affect the seasonality of some asthma cases.